Mark La Brooy was one of the participants on The Hunger Project’s Leadership Immersion Programs. He has shared some stories from his trip. “Anne was the first lady we met. She was a mix of sadness and fear but with a glimmer of hope. Anne and her husband like many in Uganda are subsistence farmers, who rely on their crops and animals to provide food. They have two young sons who were not in school. The family lives in a small mud and stick house. Anne’s biggest fears are bad health and hunger. She had not yet joined The Hunger Project, but she was interested after attending a couple of training sessions at the epicentre which were about food security. In the same area, we met some of the success stories of people who had already joined The Hunger Project. Vijewa John and his wife Mary had been involved in The Hunger Project since the Mbarara Epicentre was built in 2010. Mary had borrowed money from the Epicentre Savings and Credit Cooperative (SACCO) which they had used to buy more land and grow more bananas. They also learnt about different farming techniques. They had been able to increase their income so much, that they were able to build a new house built with bricks, a toilet and they even had a TV. Additionally, they had been able to send four of their eight children to University. However, when I found out none of his children were actually there, I started to wonder who on earth all these people were in his house. It turned out that John and Mary had taken in younger families and children from the community so that they could go to the school nearby. 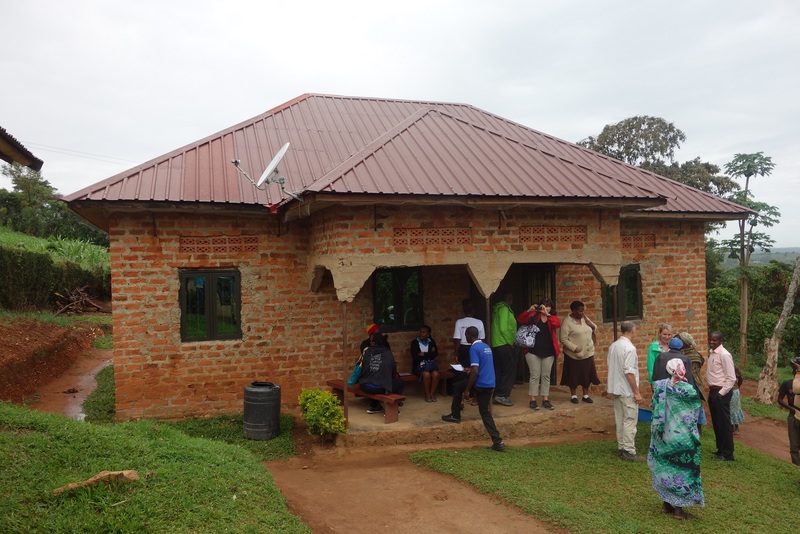 Vijewa-John and Mary had opened their new house to give back to the less fortunate. Just as I was leaving Vijewa John’s house, before I could even step off the patio I was greeted by an old woman, and as she shook my hands I could see by her thin sinewy arms, that she looked like she had led a hard life. She lead us up the hill, between banana trees and bush bean plants and just over the peak where we arrived at her small mud and stick house. It was quite a contrast from Vijewa John’s relative mansion. Her name was Varunikwi Chiwitenga Maria, and she was seventy years old. Her husband had passed away many years ago. She stood barefoot on the uneven sloped mud at the threshold of her house, explaining her story to us. The translator explained that she had been involved with The Hunger Project since before the Mbarara Epicentre was constructed. She was one of the leaders with the community garden, which started before the Epicentre was constructed. That involved 200 people. While some of the people quit when they realised they weren’t going to get handouts, Maria stayed on. She was there helping unload the two truck loads of aggregate stones used for the concrete during the construction of the Epicentre. During this time she got frustrated with the translator and insisted that some of us come into her house. 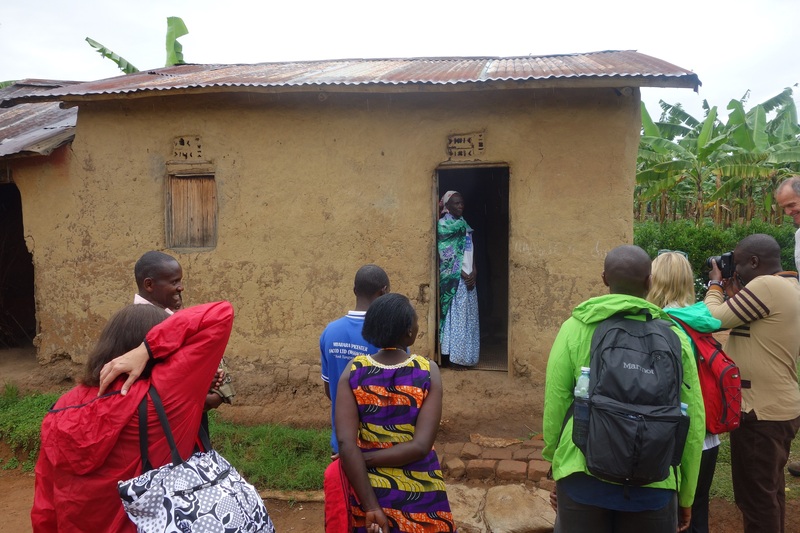 Once inside, she took her story back to before The Hunger Project arrived in Mbarara. Her first micro-finance loan she borrowed 100,000 Ugandan Shillings, (which is around $30), although unfortunately, her youngest son passed away. She used the money from the micro-finance loan to take care of her grand child and daughter-in-law after this tragedy. She repaid this loan largely though her hand-woven crafts. 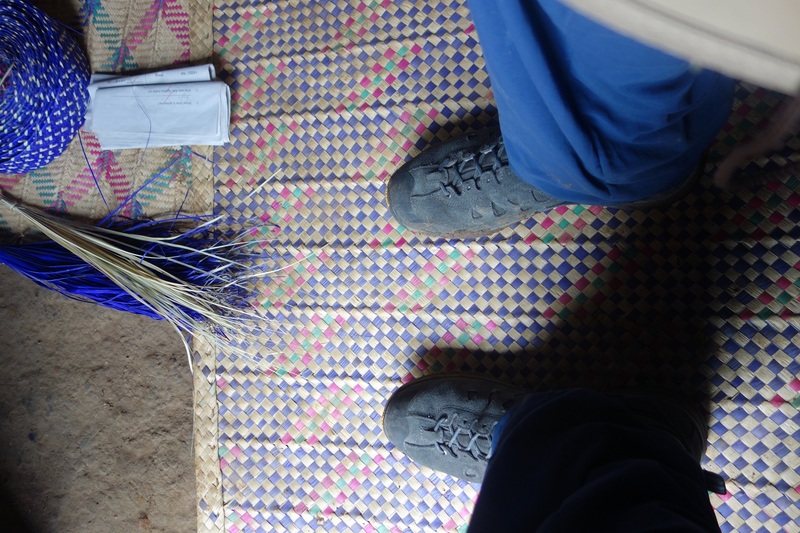 It would take her a week of weaving to produce one piece, such as this handwoven mat which my dirty boots are on) that could sell for $4. The following year in 2008, she borrowed another hundred thousand Ugandan Shillings, which she gave to her eldest son, John-Boscoe, to start a small private school, starting with just a single primary one class. In 2011 when the Mbarara Epicentre opened their SACCO, Maria was able to borrow two hundred thousand which she used to help her son get a Diploma qualification in teaching. In 2013 she borrowed nine hundred thousand shillings to improve and expand her son’s school and was able to repay the loan within a year. In 2014 she borrowed another nine hundred thousand and then in 2015, she borrowed a million to continue to develop her son’s school. 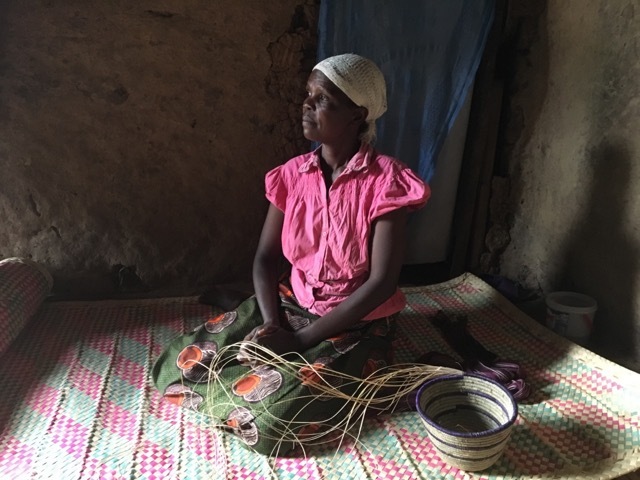 In 2016 having successfully paid back three million two hundred thousand shillings in loans, she borrowed two million shillings, to pay for a Bachelor’s Degree for her son and more upgrades for the school. Her dream at 70 was to get a mobile phone, as her health was failing and she was too old to travel. A mobile phone would help her stay in contact with relatives. We walked from her house, down the hill, through the banana trees, past some houses and some pigs. As we walked further and further, the sound of laughing children got louder and louder. After a few hundred meters we arrived at a school. This was John-Boscoe’s school. What started with a single primary one class back in 2008, had grown year by year, loan by loan. Additional classes were added and staff were hired. Mud and stick huts made way for brick buildings. 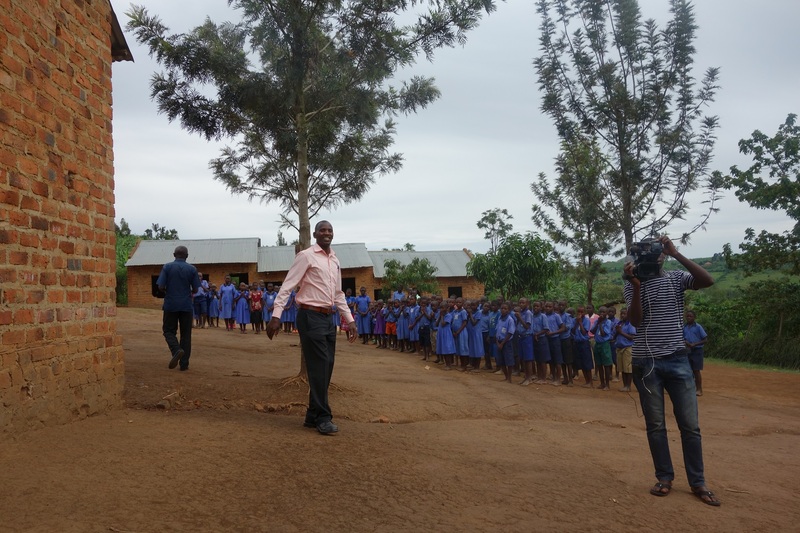 It now had ten teachers teaching over 240 students ranging from primary one through to primary seven. This was the third year of having a primary seven class successfully graduate.